St. Petersburg Police are investigating a school bus stop fight that resulted in a 16-year-old girl being stabbed in the back Thursday morning by a fellow Gibbs High School student. 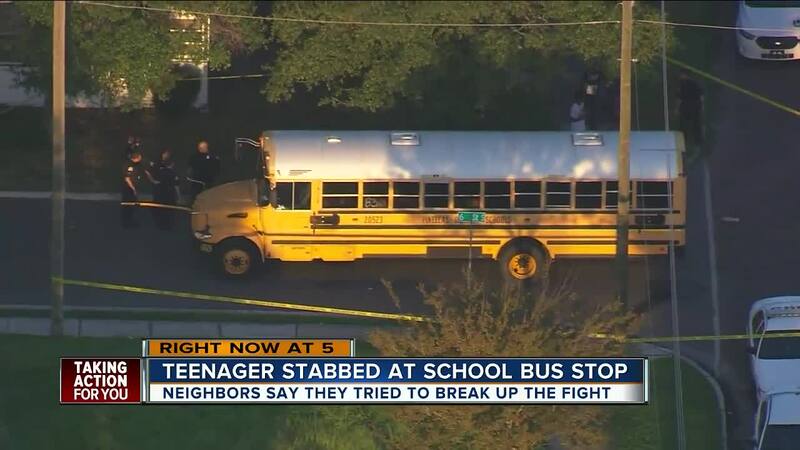 ST. PETERSBURG, Fla. — St. Petersburg, Fla. Police are investigating a school bus stop fight that resulted in a 16-year-old girl being stabbed in the back Thursday morning. Around 7 a.m., two female Gibbs High School students began fighting at a school bus stop, according to police. Neighbors said they heard a commotion. Regina Wooten and her husband dashed over from their apartment to help. They immediately tried to pull the two girls apart, until the younger student pulled out a knife. As the school bus approached, the 15-year-old girl stabbed the 16-year-old girl in the back with a knife. “She stabbed her in the back and the young girl was screaming and hollering that she was stabbed!” Wooten exclaimed. Police said the 15-year-old ran onto the bus, which had 25-30 students on board and was headed to Gibbs High School. The 16-year-old's mother rushed her to daughter to Bayfront Health Medical Center in downtown St. Pete with a serious injury. She is currently in stable condition. The 15-year-old girl was taken into custody. That 15-year-old faces two felony charges of aggravated battery and possession of a weapon on school property. She also faces an additional felony charge of aggravated assault for threatening the victim's mother with a pair of scissors. More than two dozen students were on the school bus during the incident. A support team will be available for students who may have witnessed the incident, according to Pinellas Schools PIO Lisa Wolf. Rebecca Hall knows the student accused in the stabbing and says she is shocked. “I was like wow, unbelievable! It's totally out of her character," Hall said. "It's pretty scary to know they are so young. What’s going on in the mind of that child?” Wooten added. St. Pete police are still working to figure out what led up to this violence. The investigation continues as detectives interview witnesses and review video.